This beautiful Golden mix is in Austin but was taken out of a shelter in Fort Worth where she very nearly lost her life. Please read her story and help this family find her a safe home. They cannot hang onto her. Their daughter rescued her to keep her from dying. Our daughter rescued a lab/retriever mix 1-year old female from a kill shelter in Ft. Worth where she lives last week. She is very sweet - a 1 year old golden/lab mix. The shelter told my daughter the dog would be euthanized soon. Unfortunately, she has become more that my daughter can handle - my daughter actually had her in the ER 6 hours after adopting, for an infected site where she was spayed. She called my husband and I a few days ago asking for help. This dog is very very scared. She puts on her brakes when she doesn’t want to move and my daughter was having to carry her everywhere. She cowers in corners and it is obvious she was mistreated. The vet also told her the dog has bite marks from the shelter - he said the shelter is very bad and all the dogs are just thrown in the yard together - I’m guessing she was bullied. She was an owner surrender from a home where over 10 dogs where found. This dog is now in our home here in Austin. We don't want to send her back to that kill shelter but we also cannot keep her and are not equipped to care for her. 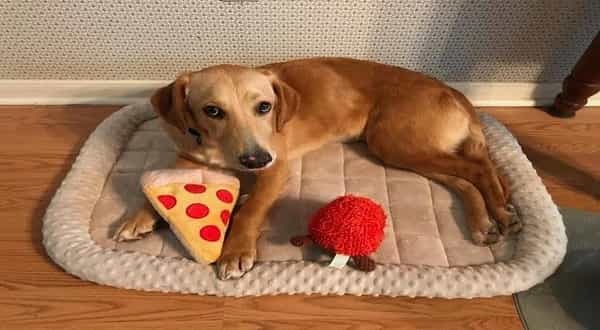 We already tried Golden Rescue and they will not take her because she is a mix. I have attached a picture of “Zelda”. She is in good physical health, has been spayed as I mentioned, heart worm negative, and received her vaccinations. She is finishing her course of antibiotics for her incision infection - however the vet looked at the site and said it has healed fine. I would appreciate your help and any information ASAP! She is not aggressive at all, doesn’t growl, and lets my husband and I pet her fine. She will occasionally give me a “kiss” and wag her tail. But it also goes between her legs a lot. She is very sweet! I think she will need a yard or easy access to one. When she gets scared and doesn’t want to go anywhere, she stops full force. Since we have had her we take her out regularly on a leash for now in the backyard and she goes just fine. As soon as her feet hit the grass, she trots around and loves to explore. She has had no accidents in the house. But again, as we stop to walk back to the back door, she freezes and won’t budge. We have to carry her back in. I’m guessing she has not been on a leash and needs leash training as well. She is just scared and is going to take time and TLC. 0 Response to "She very nearly lost her life. Please read her story and help find her a safe home"